12. How to add/edit/delete a radio? 14. Who are we? Contacting Radioways? Your contribution helps support future developments and updates. It helps to maintain Radioways as free community, free and independent. Your support is important for the sustainability of the free Radioways community! This is mainly a problem connecting to databases or cookies. We invite you to consult our cookies to check if it is not from there, or it could come from an update in progress. Otherwise thank you to send us a mail. Generally, it is recommended to periodically clear your cache to remove any unwanted cookies, and all unnecessary temporary pages in allourdissent As the sites you visit, your computer and your navigation. - You can try to close the browser and restart the site. - Otherwise you can empty the cache of your browser and restart . - Either you have not installed Flash (version 10.2 above) or flash crashed (planted) (it happens ...). We must close all browser windows and restart the site. It should have gone better. d. Finally, otherwise try with another browser, to see if it works. e. Important: 3G wifi : In some cases 3G network using WiFi or tapered at network (internet cafe, etc ...), some flows are blocked. We met mainly the concern over 3G key. Some radios have a buffer management problem. Must be break, then play again. Otherwise it might come from a low flow or heavy use of your PC slowing flash, or a flow problem. Otherwise thank you to write. If the radios remain on 'loading in progress ...' c "is the player module (Requires Flash) does not boot. - 2. WMP (windows media player) . The message 'unavailable' means that the stream of the radio is inaccessible or unavailable (many radio stations regularly change flow). b. The most likely reason is that the flow of the radio is inaccessible. We recommend search by radio name, because we often have multiple streams for the same radio. However, it could also be due to a blockage of the player if it is a radio that meets usual. 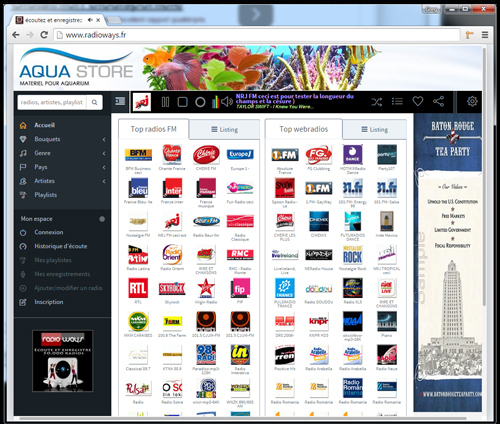 - To check: Make sure you get to see and listen to other radio stations. Then come back on this radio again. - Otherwise, perform a search by radio name , we often have several versions flows for the same radio. So test the other stream. - If not, please try to close the browser and restart the site. - If the problem persists and no other radio responds, please make the check list of the 5 points of our 'the site load not '. 7. Brownouts or total failure of her after a while. Make 'pause' a few seconds then 'play' again. This is often the buffer (setting flow buffer) that has not had time to load due to low flow. For this, you must exit the browser (close all other pages too). Then start Radioways. Everything should be back to normal. We added alternative of listening streams to meet your configuration. A large number of radios have created a 'timer' that cuts the sound or stop the spread of the stream after a while listening (usually several hours). This is to prevent the diffusion abusive, erroneous or 'forgotten' radios. You can also easily view the content stored by cookies, which are text files. 9. How to record a radio? Mp3 or mp4 recording format? You have two recording modes. Immediate and delayed When you mouse over the record button, you have a menu that opens.
? The file format you get depends on the type of broadcast radio. Most radio stations broadcast in mp3 , except that of the NRJ Group (Nostalgia, laugh & songs, Chérie FM) diffusing MP4 . In this case, the recorded file you get is mp4. - Free M4a to MP3 Converter : to convert M4A and AAC to MP3 or WAV files. By default, the number of registration is limited to 4 recordings 3 hours. To increase this limit, simply send us an email to info (at) radioways.com. Please note that it is sufficient to recover the recordings to your computer and delete them from your space to save others. Here are some freeware software for working your recordings to create your best compilations, remix or podcast, and even ringtones for your cell phone. - with WavePad : Free - powerful and complete editor - It has all the editing functions necessary for common tasks (copy, cut, paste, mix, trim, split). - with mp3DirectCut : Free - small tool for editing MPEG audio directly. You can remove parts, change the volume, split files or copy files in several new selections - Cut your recorded favorite songs and perform several mix and melted ..
On the right, in the address bar, there is a small empty star, simply click on it. Otherwise you can click on the 'favorite' in the taskbar, then 'add to favorites'. If you have this bar, simply click on the icon to the left of the address of the site and move it in this bar. If you do not want to undergo the automatic launch of a random radio, you can set the launch of your favorite radio. Simply save your favorite link 'play'. This link is in the player when listening to the radio, below the play button. You go to search, then search by name, and you type the name or partial name of your radio. To remove your radio, please upgrade to the root of your ip, a text file (urldevotrestream/radioways.txt) containing the word "delete". Otherwise you can just update your radio stream, without removing it. The reason for this control is that we have received many requests from malicious deletions from competitors of certain radios. https://www.radioways.com/radio/name-of-your-radio.html , which you will find in the player left on the site when you listen to your radio.
. We would be happy to put you ahead in the directory is free and it is based on the principle of partnership and exchange. Radioways being a non-profit directory. B. If it's just a radio that you know and not on Radioways: just the name and the radio site, we will arrange to contact them. Thank you to send us an email to info (at) radioways.com with the URL on your radio radioways (www.radioways.com/radio/nom-radio.html) to associate your email. Otherwise you can directly from our interface adding ': see point 9.2 above. 14. Who are we? How to contact us? Radioways is a collaborative working (Canada, France and Lebanon) volunteer enthusiasts among several new technologies, radios, televisions and media in general, who have put their passions, their knowledge, skills and time to create a common the main Internet radio database (our engines scan in real time all the audio streams on the Internet). We are for the 'free for all' and the spirit of community sharing in the image of Firefox or Wikipedia. We use the latest technologies and innovations available today on the net. We provide this community service free available to the entire Internet. You can support us by contacting the www.radioways.com around you (email, ...) because we have no advertising budget. Do not hesitate to contact us, whatever the meeting point we are at your disposal.